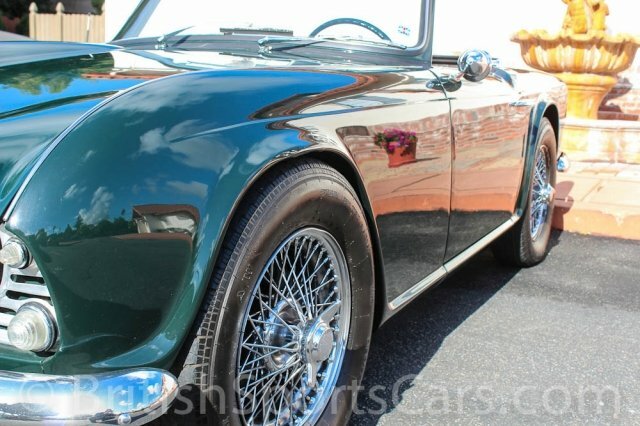 You are looking at a gorgeous 1965 Triumph TR4. This car has had one owner since 1976 and has always been a California and Arizona car. In the early nineties, this car was subject to a full ground-up restoration at a cost of over $40,000 (we have all bills and receipts for work done). Absolutely everything was rebuilt and replaced at this time. The car has been driven only 12,800 miles since and is still in show-quality condition. The car shows no signs of every having any rust or accident damage. The upholstery is all in excellent condition and the seats are covered in leather. The car comes with a convertible top that is in like-new condition. It is fitted with the rare optional factory overdrive that works excellent. The car runs and drives just as good as you would expect for a fully restored car. Please feel free to contact us with any questions you have.